A study of military men cracking under stress, The Caine Mutiny is a tension-filled character-driven drama on the high seas of World War Two. Humphrey Bogart is excellent in an against-type role as a cowardly captain, a disciplinarian who never gains the respect of his men. World War Two is raging , and Ensign Willie Keith (Robert Francis) graduates from the naval academy and is assigned to serve on the Caine, a rust-bucket of a minesweeper. Under the command of Captain DeVriess (Tom Tully), the Caine is a loosely run ship, with flagrant disregard for most rules and regulations. 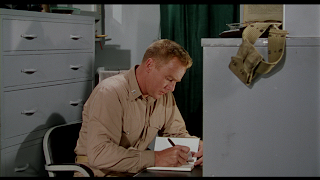 Lieutenant Maryk (Van Johnson) is second in command, and the easy-going Lieutenant Keefer (Fred MacMurray) is among the group of senior officers, but he is more interested in writing his book rather than acting as an officer. As Keith learns about life on a military boat by making mistakes, DeVriess is relieved of command, and replaced by Captain Queeg (Bogart), who immediately sets about instilling discipline and alienating the officers and crew. Queeg's obsession with minute details while ignoring more important matters borders on irresponsible, and behind his back, Keefer starts to call him paranoid. The rest of the officers label Queeg a coward when he refuses to take responsibility for his mistakes and appears to flee a combat engagement. With Keefer's encouragement, Maryk starts to consider whether he should relieve Queeg of command, a situation that comes to a head during a wild typhoon. Based on Herman Wouk's novel, The Caine Mutiny boasts a powerful cast delivering accomplished performances. In addition to Bogart, Johnson and MacMurray as the three strong personalities on board the Caine, Jose Ferrer makes a strong impression in the final third as Lieutenant Greenwald, the lawyer assigned to argue the mutiny case at a military court martial. 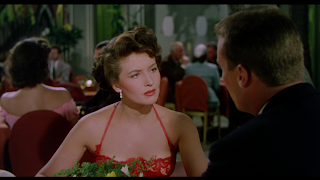 Also in the cast is May Wynn (playing a character called May Wynn), Keith's love interest in an example of a sputtering but watchable romance injected into an otherwise male-dominated film. Even minor roles, such as Keith's mother (Katherine Warren), E. G. Marshall as the other court martial lawyer, and the scuzzy crew members (including Lee Marvin) are lively. The story is told through Keith's eyes. In between interludes where he and May try to decide if they belong with each other, Keith gets to experience the extremes of DeVriess and Queeg, and is finally swept up in the events of the mutiny. Robert Francis delivers an earnest performance, a man trying hard to make a good impression but learning most by stumbling into unexpected missteps. Francis' promising career tragically ended when he died in a small plane crash in 1955, at age 25. In a relatively small but pivotal role, and only 18 months away from his own demise, Humphrey Bogart is dominant. Bogart sheds his cool, confident persona to portray Queeg as a man damaged by too much combat, focusing on all the wrong things as his world begins to fall apart. Bogart delivers a couple of his all-time career best scenes in The Caine Mutiny, first asking the officers with great humility to help him create a better team, and then in the witness chair trying to hold himself together to testify at the court martial. 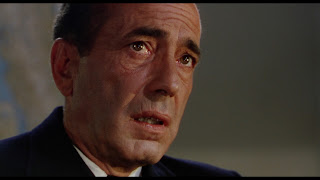 There is fear, hesitancy, and internal conflict etched on Queeg's face throughout the movie, and Bogart deservedly was nominated for a Best Actor Academy Award. Beyond Queeg, The Caine Mutiny shines as a study of three other intriguing men, director Edward Dmytryk admirably focusing his movie on the labyrinthine motivations of the officers. Keefer is the classic agent provocateur, insidiously influencing events while avoiding responsibility, traits that he maintains from on-board the Caine to the court martial. MacMurray makes Keefer smooth and dangerously likable, a man who will slither up with a seemingly innocent opinion that will only get others in trouble. Johnson gets a more straightforward role as Maryk, an honest man genuinely wanting to demonstrate loyalty, but troubled by what he sees from Queeg and prodded by what he hears from Keefer. And late in the film Jose Ferrer brings to life the complex lawyer Greenwald, reluctantly accepting his assignment, executing brilliantly, helping the judges reach the right conclusion, and then delivering his own devastating verdict on the men of the Caine. Greenwald gets to the root of the mutiny, one clear-headed man delving into the true causes of a nasty incident that was triggered long before the typhoon struck the Caine. While it may be easy to identify paranoia in one man, it's more troublesome to reveal gradually building ill-will in the hearts of the seemingly healthy.